Columbia Sportswear offer a superb range of outdoor clothing and products, in various ranges which are suitable for walking, running, cycling, ski-ing and other wintersports. At CozyMole, we are strong supporters of Columbia's ranges of children's outdoor clothing, as they provide very high quality, well designed products, with grown-up technologies which make them very practical for both kids and parents alike. See our information below for details of how some of these technologies will benefit you and your child. Whether you're looking for a full winter jacket, or a sun hat, Columbia have a huge range of products for all occasions. Their design philosophy is to make their products such that they are perfect for your chosen activity, but also perfect for everyday use as well. Their trousers, for example, are quick drying, lightweight and packable, but also have well placed pockets, zip-off legs (some models) and 'blend-in' styling. We also stock a limited range of adult products from Columbia, but are happy to order-in other garments, colours or sizes at your request. For the coming winter, we have strengthened our children's ski clothing range, so if you're looking for well chosen, great value children's ski clothes then have a look at our range. 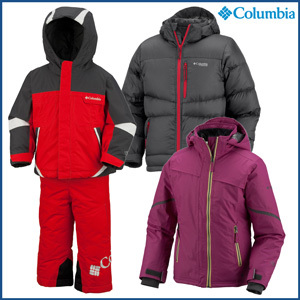 For this season, Columbia have a great new children's range in the UK, especially in the toddlers ski clothing. The brand new Columbia Boys Buga Set uses Columbia's Omni-Tech waterproofing technology straight from the adult products. Last year's very popular Columbia General Dobby Set has been replaced by the Columbia Snow Go-er Set, and the girls equivalent is the Columbia Snow Glow Set - both are fantastic quality 2 piece jacket and salopette sets with lots of insulation and child friendly features. The Columbia Snow Monkey Set (boys) and Columbia Twinkle Zip Set (girls) are also 2 piece sets but have a long zip on the inside of the salopette legs to allow easy nappy/toilet access without having to remove either jacket or salopette. The use of Omni-Shield continues on many of the kids Columbia ski-wear products, which helps keep them clean and dry. Columbia have increased the use of their Omni-Heat technology in the new range, which means that you can have very warm products without excessive bulk. For example, the new Spaceheater II jacket for boys is a 700 fill power down jacket, and uses Omni-Heat to acheive very high levels of warmth and comfort. It even has Omni-Shield, so is sufficiently water resistant that Columbia has made the jacket with a (detachable) hood - a down jacket which you can wear in the rain without it absorbing water. If you're choosing children's ski clothes remember that, especially for little ones, it's important to layer up. Babies and toddlers who are not ski-ing will get cold quickly if they are still - make sure you choose appropriate layers to go under their outerwear. Omni-Heat is a collection of thermal technologies which improves the way that clothing and footwear manage your temperature. The Thermal Reflective technology uses a layer of small silver reflective dots on the inside of garments or footwear to retain radiated heat which your body would normally lose, yet maintain breathability. The Omni-Heat insulation is a new type of artificial insulation which is used in outerwear to deliver class leading insulation in a lightweight product. When these technologies are used in jackets, boots, and even base layers, the resulting products are very thermally efficient, which means you stay warm and comfortable and the products stay lightweight. Omni-Shield delivers protection from the outdoors where you least expect it but need it most. This coated fabric resists all liquids below 76 Celcius from absorbing into the yarns and staining the garment (without any effect on the feel of the material). The fabric itself will also dry 3-5 times faster than untreated fabric, without holding moisture like a conventional fabric, meaning it stays lighter even when its wet. This is a brilliant technology for kids, and is used on some of this season's new products (for example the new boys Zip Suit and girls Powder Princess Suit). It's so good that even 'disaster spills' like orange juice, tomato or even red wine just roll-off the garment and do not adhere to or soak into the surface at all. Very practical for young children! Columbia Sportswear's Omni-Tech ® products provide premium waterproof and breathable protection by keeping outside elements from getting in, while still allowing moisture vapors to move away from the skin. Microporous membranes keep water from penetrating the fabric yet allow perspiration to escape, so you stay dry. Omni-Tech's first layer of defense is Omni-Shield ®, which prevents most water from ever making contact with the inner layers. Next, a microporous membrane provides the primary and most impervious layer of defense by completely blocking the passage of water molecules into the fabric. Omni-Tech membranes are 100% air permeable, which allows moisture vapors to escape. This superior breathability keeps you dry from the inside out. Lastly, lining materials protect the Omni-Tech membrane from underneath, while adding additional wicking properties. Waterproof. Breathable. Guaranteed. Omni-Tech is a 'dry' breathable system, unlike several well known competitors, so it does not require moisture to build-up inside the garment in order to start breathing. Omni-Dry ® is the ultimate moisture-management technology for the outdoors. Its superior wicking properties move moisture away from the body and enable perspiration to evaporate quickly. During physical activity, increased body temperate causes perspiration (you know: sweat). Normally this results in damp, clammy, and uncomfortable clothing (not to mention unattractive). With Omni-Dry clothing, moisture is quickly wicked up into the fabric, and away from the wearer's skin. The moisture spreads out across the surface of the fabric where it quickly evaporates. This wicking/evaporation process keeps the wearer cool and the clothing dry. You stay dry, which helps regulate temperature, prevent chafing and keep you comfortable all day. Work up a sweat without getting all wet. Omni-Dry products also dry-out extremely quickly after washing, so are great for a quick turnaround after your kids outdoor clothes get dirty. Columbia Sportswear's Omni-Shade ® clothing protects you from damaging UV radiation by blocking the majority of the sun's harmful rays, so you can stay out longer. Omni-Shade blocks Ultraviolet A and Ultraviolet B rays (UVA and UVB), helping to prevent sun burn and long-term skin damage through tight weave construction, UV reflectors, and UV absorbing technology. Unlike SPF (Sun Protection Factor), which is a measure of sunburn reduction from sunblock, and does not indicate any protection from UVB rays. UVB rays are much more harmful than UVA, and are present even on cloudy days. Omni-Shade provides protection from both UVB and UVA rays. Like sunblock, Omni-Shade is given a numeric value to indicate its level of sun protection. Unlike sun block, Omni-Shade does not wear off. Your safety increases as the Ultraviolet Protection Factor (UPF) increases, and several levels of Omni-Shade protection are avialable: UPF 15, UPF 30, UPF 40 and UPF 50+. It's like sunscreen, but you don't have to reapply. All Omni-Shade fabric carries The Skin Cancer Foundation's Seal of Recommendation, given to sun-protective fabrics that have a minimum UPF of 30. Omni-Shade products offer peace of mind without sun cream - it's more comfortable and less messy than suncream, and doesn't wear or wash off. So you can concentrate on keeping the exposed skin protected with cream, without worrying about harmful rays going through clothing.